Temperatures are rising, summer is almost here and the cool waters of swimming pools, rivers and lakes are attracting plenty of swimmers. But the beginning of all this outdoor fun also means the start of the water accident season. Prevention is much easier and more successful than treatment. Children don’t generally splash when they have difficulty in the water, but slip silently under the surface. In most cases, supervising adults reported stepping away for less than five minutes. Do you know what drowning looks like? Read the article below about the Instinctive Drowning Response and Signs of Drowning. The lifeguard moving quickly past Lindsey’s chair seemed to come out of nowhere. Four steps later he was in the air, jumping right in the middle of where her children were playing. Before she could get to her feet, the teenaged guard had her 10-year-old pressed up above the surface and was backing up to the pool edge. Someone was screaming her child’s name and the young boy started crying. Her little boy had been drowning right in front of her and she didn’t have any idea it was happening. It wasn’t until the guard let him go and he ran, dripping wet, into her arms that Lindsey realized that she was the one screaming. What did the guard see that this mother didn’t? Drowning is not the violent, splashing, call for help that most people expect. 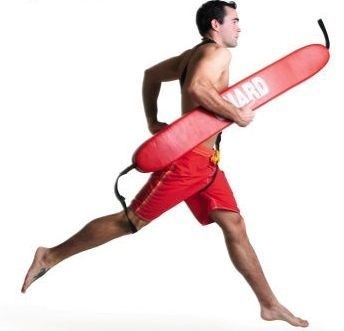 The lifeguard was trained to recognize drowning by experts and experience. Lindsey, on the other hand, had learned what drowning looks like by watching television. If you’re going to have your kids near the water, then you should make sure that you know what to look for whether around lifeguards or not. As a former Coast Guard rescue swimmer, stories like Lindsey’s don’t surprise me, and I hear them all the time. Drowning is almost always a deceptively quiet event. The waving, splashing, and yelling that dramatic conditioning (television) prepares us to look for, are rarely seen in real life. The Instinctive Drowning Response – so named by Francesco A. Pia, Ph.D., is what people do to avoid actual or perceived suffocation in the water. And it does not look like most people expect. There is very little splashing, no waving, and no yelling or calls for help of any kind. To get an idea of just how quiet and undramatic from the surface drowning can be, consider this: It is the number two cause of accidental death in children, age 15 and under (just behind vehicle accidents) – of the approximately 750 children who will drown next year, about 375 of them will do so within 25 yards of a parent or other adult. In ten percent of those drownings, the adult will actually watch them do it, having no idea it is happening (source: CDC). 1. Except in rare circumstances, drowning people are physiologically unable to call out for help. The respiratory system was designed for breathing. Speech is the secondary or overlaid function. Breathing must be fulfilled, before speech occurs. 2. Drowning people’s mouths alternately sink below and reappear above the surface of the water. The mouths of drowning people are not above the surface of the water long enough for them to exhale, inhale, and call out for help. When the drowning people’s mouths are above the surface, they exhale and inhale quickly as their mouths start to sink below the surface of the water. 3. Drowning people cannot wave for help. Nature instinctively forces them to extend their arms laterally and press down on the water’s surface. Pressing down on the surface of the water, permits drowning people to leverage their bodies so they can lift their mouths out of the water to breathe. • Ladder climb, rarely out of the water. So if your children are playing in the water and everything sounds OK – don’t be too sure. Sometimes the most common indication that someone is drowning is that they don’t look like they’re drowning. They may just look like they are treading water and looking up. One way to be sure? Ask them, “Are you alright?” If they can answer at all – they probably are. If they return a blank stare, you may have less than 30 seconds to get to them. Remember – children playing in the water make noise. When they get quiet, you get to them and find out why.